Where Does the Condition Originate? 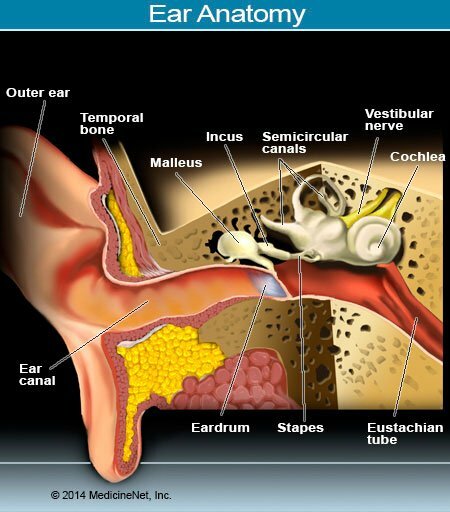 What Diseases, Conditions, and Medications Cause Tinnitus Symptoms? What Should I Do If I Have Signs and Symptoms of Tinnitus? Which Types of Doctors and Other Health Care Professionals Treat Tinnitus? Is There a Test to Diagnose the Cause of the Problem? Can This Problem Be Prevented? The main symptom of tinnitus is hearing sound in your ears not due to an external source that no one around you can hear. The noise is often described as ringing, buzzing, clicking, or rushing. Hearing loss and dizziness may occur if the tinnitus is due to Meniere's disease. Because tinnitus is due to other health conditions that may require medical treatment, it should be evaluated by a doctor, especially if the tinnitus is only on one side, is sudden, or is associated with hearing loss. Treatment of tinnitus depends upon the cause and may include medications, stress reduction techniques, biofeedback, lifestyle changes, tinnitus retraining therapy (TRT), masking devices, and cognitive behavioral therapy (CBT). Home remedies are generally not recommended for tinnitus because they may not address the underlying cause. The best way to prevent some cases of tinnitus is to avoid damage to your hearing, such as loud noise exposure. For many other causes there may be no way to prevent the accompanying tinnitus symptoms. There is currently no cure for most cases of tinnitus. Symptoms of tinnitus may come and go over time, and if you have had tinnitus it's likely it will recur. While it may be annoying, most people can learn to cope with it. Stress, diet, and noise exposure may worsen symptoms. Tinnitus is pronounced tih-NIGHT-us or TIN-ih-tus. Some tinnitus or "head noise" is normal. A number of techniques and treatments may be of help, depending on the cause. Subjective tinnitus: This is the most common type of tinnitus because you hear a sound, but no one else can hear it. Clicking or pulsatile tinnitus: The noise it produces usually is a buzzing or ringing type sound, but it may be a clicking or rushing sound that goes along with your heartbeat. Objective tinnitus: This is a much more uncommon sort of tinnitus. With this type your doctor may sometimes actually hear a sound when he or she is carefully listening for it. Tinnitus is not a disease in itself but rather a reflection of something else going on in the hearing system or brain. Trauma: If tinnitus is caused by trauma to the ear it usually is noticed in both ears, because both ears generally are exposed to the same noises, drugs, and other influences. Medications: Drugs such as aspirin (if overused), aminoglycoside antibiotics (a powerful form of infection-fighting drug), and quinine. More than 200 different drugs are known to have tinnitus as a side effect. Meniere's disease: Symptoms include dizziness, tinnitus, and fullness in the ear or hearing loss that can last for hours, but then goes away. This disease is actually caused by a problem in the ear itself. The tinnitus is merely a symptom. Clicking types of objective tinnitus can be caused by TMJ misalignment problems, or "twitching" of muscles of the ear or throat. Most newly noticed tinnitus should be evaluated by a doctor or other health care professional. Because tinnitus usually is a symptom of something else, if it begins suddenly, see your doctor. This is particularly important if the tinnitus is only heard on one side. Although the majority of cases of tinnitus are not caused by any acute medical problems, certain symptoms and signs need to be evaluated to determine whether or not a more serious medical condition is causing the symptoms. If you begin having any of these issues call your doctor or other health care professional for evaluation. Any time tinnitus or ringing in the ears comes on suddenly, particularly in one ear, or is associated with hearing loss. Sudden hearing loss is often accompanied by tinnitus, and there are medications that may help to restore hearing. Also certain types of tumors can cause sudden hearing. Any time the problem is noticed in association with changes in personality, difficulty speaking or walking, or with any other movement problem, you should be evaluated for the possibility of a stroke. If you have constant ringing in the ears and it's affecting your daily life, see a doctor or other health care professional. The initial diagnosis of tinnitus may be made by a general practitioner or internist. You may be referred to an otolaryngologist (an ear, nose, and throat specialist, or ENT). The initial medical evaluation for tinnitus will include a complete health history and physical examination of the head and neck including the various nerves in the area. A complete hearing test (audiogram) will also be performed. Depending on the type of tinnitus, either a special audiogram known as an auditory brainstem response (ABR) or a brain scan such as a computerized tomography (CT) scan or magnetic resonance imaging (MRI) may also be required. In some cases, your blood pressure and possibly some blood tests to evaluate thyroid gland function may be taken. In very rare instances, a spinal tap may be performed to measure the fluid pressure in the skull and spinal cord. If you having ringing in your ears, you should be evaluated by a doctor or another health care professional. Treatment of tinnitus depends upon the cause. Most cases of tinnitus should be evaluated by an ear, nose, and throat doctor before home treatment begins to be sure that the tinnitus is not caused by another treatable problem. Treatment for tinnitus depends on the underlying cause of the problem. In the majority of cases, it's caused by damage to the hearing organ. In these cases, there is normally no need for treatment other than reassurance that the sounds are not being caused by another treatable illness. In the very rare instance where tinnitus is extremely bothersome, there are a number of treatment options. Some of the most helpful include anti-anxiety or antidepressant medication and sometimes maskers-small devices like hearing aids that help to block out the sound of the tinnitus with "white noise." "Sound therapy" uses external noises to help change a patient's perception of, or reaction to, tinnitus. These external sounds may mask the tinnitus, or help distract from it. Wearable sound generators that fit into the ear use a soft sound such as random tones, music, or a "shhhhhh" sound, to help mask the tinnitus. Avoid caffeine because it may worsen symptoms. Tinnitus retraining therapy (TRT) trains you to accept the sounds from tinnitus as normal, helping you to be less aware of it. Masking devices resemble hearing aids and produce low-level sounds that can help reduce awareness of the sounds. Similar to TRT, cognitive behavioral therapy (CBT) may help retrain you to feel less distressed with the noise. Psychological counseling may help people learn to cope by giving them tools to change the way they think about and react to their symptoms. Hearing loss worsens the effect of the issue, so wear hearing protection and avoid loud noises are very important in preventing the sounds and symptoms from worsening. Hearing aids may help people when hearing loss accompanies their tinnitus. Hearing aids can be adjusted and make it easier to hear, making it less likely to notice it. If severe hearing loss accompanies tinnitus, cochlear implants may be used. Like a hearing aid, these devices can help patients hear outside noises better, which can help mask the sounds. For people whose tinnitus is very loud or persistent, a new technique called acoustic neural stimulation helps change the neural circuits in the brain helping desensitize you to the sounds and other signs. If it's caused by TMJ bite realignment or other dental treatments may help relieve symptoms. Osteopathy, physical therapy, or chiropractic may help ease symptoms. In extreme cases, surgeries such as neurectomy (removal of the cochlear nerve) or microvascular decompression (decompressing the cochlear nerve) may be performed to relieve symptoms. In cases where the tinnitus is caused by one of the other rare problems (such as a tumor or aneurysm), treatment involves fixing the main issue. Although this does not always resolve the issue, some people note relief of their symptoms. Only a very few cases of tinnitus are caused by identifiable, repairable medical conditions. Transcranial magnetic stimulation, antidepressants, and anticonvulsants treatments are not recommended by the American Academy of Otolaryngology. The only real prevention for tinnitus is to avoid damaging your hearing. Most causes other than hearing loss do not have prevention strategies. Protect your hearing at work. Your work place should follow Occupational Safety & Health Administration (OSHA) regulations. Wear ear plugs or earmuffs and follow hearing conservation guidelines set by your employer. Even everyday noises such as blow drying your hair or using a lawnmower can require protection. Keep ear plugs or earmuffs handy for these activities. Tinnitus and Aspirin Use: Be Careful! Most everyone has taken an aspirin now and then to relieve aches, pains, and bruises. Some people take a small daily dose of aspirin for heart attack treatment and prevention. Have you ever lost count of how many you've taken in one, two, or even three days? One of the earliest symptoms of aspirin poisoning is ringing in the ears, or tinnitus. More serious symptoms are vomiting, dehydration, and double vision. Be careful because taking to many can cause acute aspirin poisoning. What kinds of treatments have been effective for your tinnitus? What was the cause of your tinnitus? Please describe your experience with tinnitus. What medical treatments have been effective for tinnitus?